Keep a helping hand next to your tub. 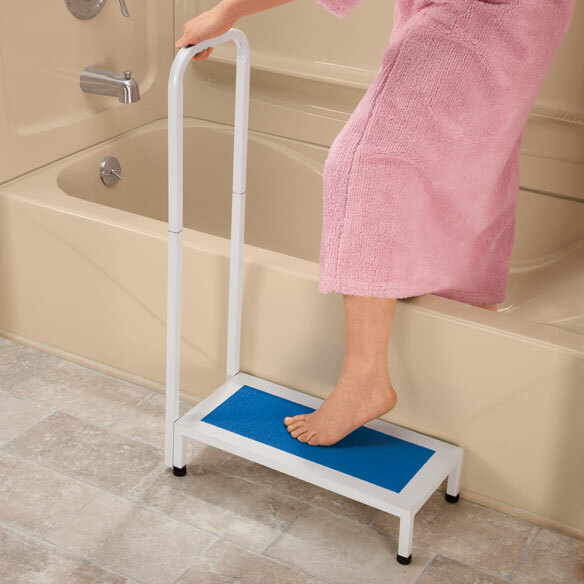 Bath safety step's long, textured platform prevents slips. Handrail helps evenly distribute weight to avoid strain. Bath step stool has a durable steel construction with anti-slip rubber feet that supports up to 500 lbs. Step measures 5" H. 21 1/4" L x 9 3/4" W x 34 1/4" H overall. Easy assembly required. Use in bathroom for security. It used to get in and out of the bathtub with easy, There are none that is not good. This is SO easy to assemble! I'm 93 now. This was a piece of cake to put together. It really does help to get in/out of the tub. I only stand in the shower. No sitting down for me these days. Or, if I sit, it's always on a bath bench. My Dad loves the extra stability of the handle but his one complaint was that it was too thin. Would buy again at lower price...only!!! Used to get up onto bed. Step just high enough and with the handle, steadies my ability to step up. The non-slip sandpaper used to cover step was half off. Was able to restick to step and worked ok. There were only enough screws for the need and one screw didn't even have indentations for the screwdriver. There was a small but very sharp puncture hole in the handle which could have caused injury to the person using it. Two of the pieces did not fit into each other as required and had to be rebent and hammered to make it fit. The quality was not up to the price that was charged. This has to be assembled. The item I received was defective, missing a drill hole. As a result, it was impossible to assemble. Company would not ship replacement part, asked me to repack and ship back, which I am unable to do. It was their defect, not mine! Will never buy from them again. Step too high coming in bldg. Having hard time getting in & out of bathtub. Hoping this will help. My wife is short and needs assistance in entering and leaving a bathtub. My friend is elderly and very short. She has an old fashioned claw foot bathrub and I'm afraid she'll have more problems getting in and out as time goes by. I'm glad I found this, as the tub railings probably wouldn't work on her old tub. trouble getting into bathtub, knee, hip, back problem. Helps to support getting in and out, extra height helps. For my husband to help him get into bed from a wheelchair. Easier to step up in the garage. For my wife to get in and out of the bathtub easier and safer. my wife needs this to get in and out tub safely. I need to get out of the bath tub easier. So that my 90 year old mother can get into the tub easier. Need assistance getting in an out of the tub. It is a little hgih. Ordered item to assist in getting in and out of bathtub or shower. I CHOSE THIS ITEM TO HELP GET IN AND OUT OF THE BATH TUB. help to get out of my pool. Actually, I want this item to place an item on rather than using as a step stool. Have trouble getting in and out of tub. to go up and down stairs, its like a half step, a friend has one and uses it like that. Most steps are 6 to 8 inches from the floor. I needed one that was between 4 and 5 inches from the floor. BEST ANSWER: Thank you for your question. The bath step measures 5" high. We hope this information will be of help to you. BEST ANSWER: I got mine quite a while ago. If I remember correctly, I only had to add the handle, and it was quite simple. I use it to cut down the height of a step from my landing (garage entry with basement stairs) up into the kitchen which is slightly higher than usual. Works like a charm. I love it. Yes. Buts it's a very simple 5 minute or less step of attaching the handrail to the actual step stool. The hardware is already included. I hope this helped the shopper. Some assembly required. The handle needed to be installed, but it was very easy to do. Yes but it is very easy to put on handle and feet. I did it myself. Use it everyday! BEST ANSWER: Thank you for your question. No, the handrail is not detachable unless you wish to take the screws out. We hope this information will be of help to you. First step is not too low? BEST ANSWER: Love it! Was purchased for 5'5" adult daughter to get in/out of bathtub after surgery. It is so handy we keep it up all the time. No we don't think too low. For me it was just right. I just had a hip replacement and needed a little help to get in my tub. BEST ANSWER: Thank you for your question. The Bath Safety Step weighs 7.7 lbs. We hope this information will be of help to you.